A major new immersive, interactive exhibition presents new insights into author Tove Jansson’s life and influences with rare archive objects and illustrations built into the experience. Part of the Southbank's Nordic Matters season. I didn’t know much about Moomin before I went to this exhibition I have to admit; however I did remember the iconic character popping up as a child. This exhibition really takes you on an amazing journey as you are immersed in the world of Tove Jansson’s Moominland and the never seen before sketches and artworks. You’re guided through Moominland’s amazing seasons bya very well informed guide and it’s done so well that I think it’s a definite must-see that will sure to delight and make you feel like a kid on an adventure again. Tip: Have some drinks by the Thames and watch the sunset after the exhibition. Good For: something different, date night, catch up with friends, small groups, indoor activity. Adventures in Moominland breaks new ground when it comes to interactive and immersive exhibitions. From the moment you enter through the cover of a book in an unassuming corner of the Southbank Centre, you're sucked into Tove Jansson's world - from canvas tents to the Finnish arpelago. To experience the exhibition you book a time slot, and each group has a personal guide who leads the way. This allows for a fair amount of personalisation; as a group full of adults I think we received much more of the backstory on Tove's influences and relationships than we would have done had there been small children in the party. Having said that, there was plenty for children to experience, touch and wonder at. As a fan of the Moomins but not an expert, I found the experience both fascinating and enjoyable. My boyfriend (fairly indifferent to Moomins) absolutely loved it too. Two months later we still talk about it, and I'd highly recommend booking a ticket for the summer! OH.MY.GOSH - this is a childhood dream coming true and I if I had had the chance I would now be happily living in Moominland. 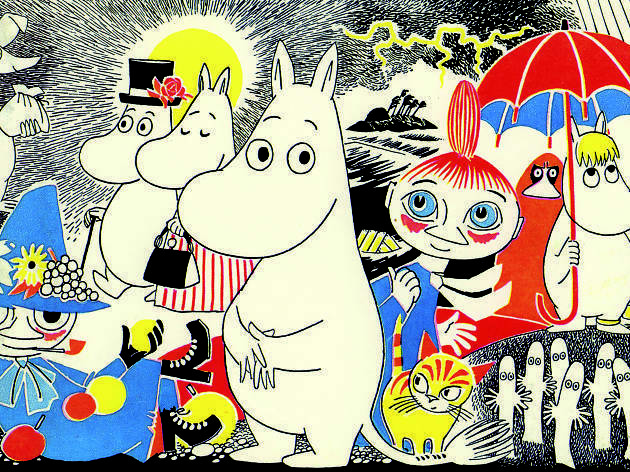 It's a great exhibition and you learn more about both, Tove Jansson and the Moomins. I have to admit I never questioned her background story and it was great to get an insight, while sitting in a tent or walking through snow. If you like the Moomins you can't miss it and it's hard to put it in writing, as you have to be there. Just to add: the staff is doing a remarkable job in telling stories and interacting with kids. Just be aware that you need to book in advance to avoid disappointment when you get there. This exhibition is a great and unique way to learn more about Tove Jansson the author/ artist of the great Moomins and more about Moomins and the other characters that appear in her books. I loved going on the journey through Moominland clambering through a forest, sitting in a tent, huddling in a cave etc. It was so interesting to learn in this unique way that the majority of her stories and chacters all was related to do with her life from romance to depression. So if you love Moomins and like Tove Jansson I highly recommend you to go along to this uniquely displayed exhibition. There is also adult nights only if you wanted on Thursday and Fridays at 7pm but book in advance for its limited to a certain amount of people. I enjoyed this interactive exhibition but then again I love Moomins. There is also a small shop in which you can purchase some Moomin merchandise be it measuring spoons, a toy, a mug etc.